The original version of this review was published in The Critical Movie Critics in 2017. For some, watching an M. Night Shyamalan film is an experience that fills them with dread. But this dread can be separated in two distinct camps: First, the good kind of dread that accompanied Shyamalan’s first blockbusters in Hollywood — The Sixth Sense (1999), Unbreakable (2000), Signs (2002) — all quietly unsettling thrillers that, despite some weaknesses, still hailed Shyamalan as a filmmaker with unparalleled gifts; and second, the bad kind of dread that was felt by anyone who sat through his later films such as Lady in the Water (2006), The Happening (2008), or The Visit (2015), cringe-inducing flicks where logic went out the window in waves of implausibility that belied the director’s original promise. What happened to this wunderkind and how exactly did he lose his touch? 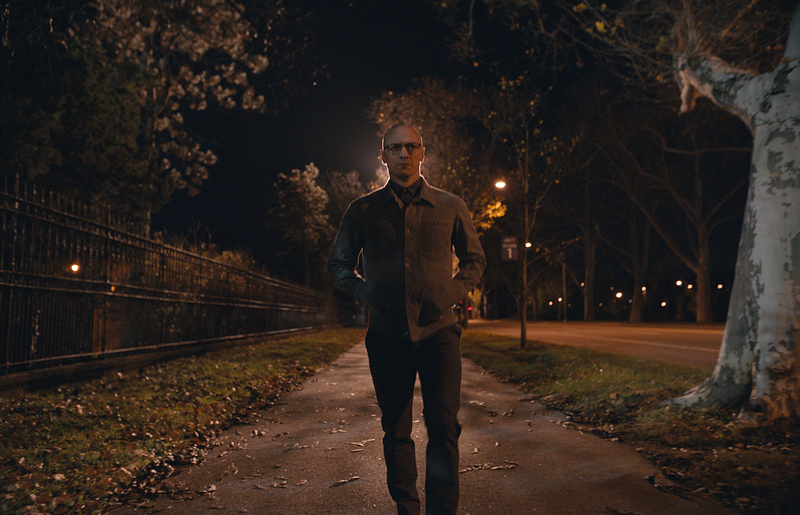 With his new film Split, Shyamalan delivers an unexpectedly solid piece of horror entertainment that feels like the film he should’ve made right after The Village (2004) and before he went off course. The story centers on Kevin (James McAvoy) a man with Dissociative Identity Disorder who kidnaps three teenage girls and locks them up in a basement for some unclear purpose. As the young women interact with Kevin, they start to realize he has other personalities inside: Dennis, the voyeuristic abductor; Patricia, a stern cross-dresser; Hedwig, a nine-year-old boy. In fact, Kevin has a whopping 23 different “characters” that take turns manifesting, a fact we eventually learn from the longtime psychiatrist (Betty Buckley) who treats him. It is also revealed that Kevin’s own body chemistry changes with each personality, able to affect physical traits such as voice, posture, and strength. This being a Shyamalan movie, there’s also a rumored 24th personality called The Beast that is waiting to come out . . . and of course, it does, making an appearance towards the film’s climax, as the most savvy and thoughtful of the teenagers, Casey (Anya Taylor-Joy), comes face to face with the worst embodiment of Kevin’s scarred psyche. I am sure you’re rolling your eyes, but it all plays out surprisingly well, with an emphasis on silent moments that ramp up the tension. Shyamalan, a wizard behind the camera above anything else, frames his 2:35:1 compositions as tightly as ever, going back to the meticulous control of his earlier films, most notably Unbreakable. Just the opening scene alone is a master class in restraint and suspense, as Kevin subdues Casey’s friends (Haley Lu Richardson and Jessica Sula) with chloroform spray as she looks on in shock and disbelief, virtually unable to move. However, there are two very specific reasons why Split rises above similar fare: James McAvoy as the troubled Kevin and Anya Taylor-Joy as the equally troubled Casey. Giving these two characters similar backstories of familial abuse comes across as heavy-handed, yet both actors manage to imbue their performances with layers of unspoken grief. Taylor-Joy — fantastic in The VVitch (2015) — once again proves to be a talent to watch: Just the first shot of Casey, sitting away from other friends at a restaurant, speaks volumes about her character, an outcast who in many ways is as broken as Kevin. And McAvoy has creepy fun in a role that asks him to switch from role to role effortlessly without going over-the-top, one moment a boy trying to kiss a girl, the next a fearsome monster that can climb walls (and apparently eat people). As Split comes closer to its slightly bonkers supernatural denouement, the suspension of disbelief starts to strain. But it’s somehow held together by McAvoy and Taylor-Joy’s commitment to the material. There’s also a final “twist” in which Shyamalan references one of his earlier movies, and although it’s utterly unnecessary, the film geek in me found it oddly interesting (hint hint: A sequel to both films is coming). In any case, don’t think about it too much and just take Split for what it is: A cool little suspense flick that will make you think that maybe, just maybe, Shyamalan is back.